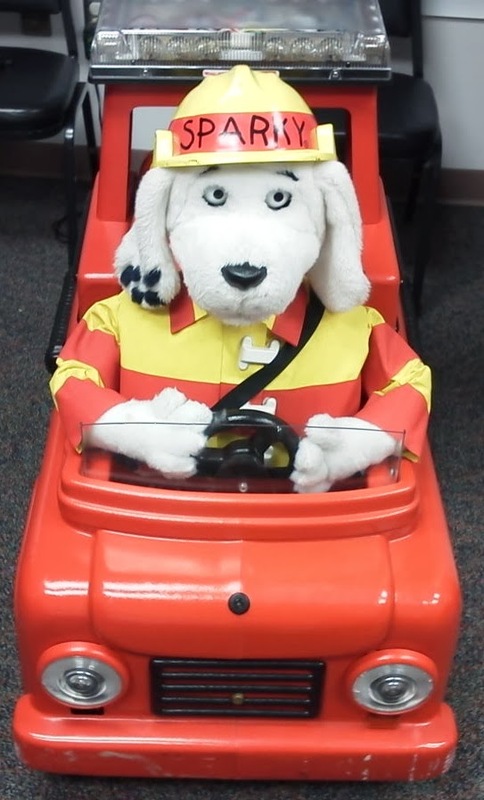 Part of our successful fire prevention program is Sparky the Fire Dog Robot whom brings a smile to all kids and adults alike. Children are awed by sight of Sparky who rides around in his fire truck delivering a memorable message about fire safety. All features on the unit work such as the LED Light Bar, Head Lights, Squirt cannon on the front, Forward Reverse and Steering. The Robotics of Sparky including the eye movements and head swivel work fluidly. The intercom between the Robot and the User along with all speakers are in working order. Well cared for unit comes with transportation ramp, cover, battery charger, and remote control. Contact B. Niggli with any questions at 586-2413.